In 2011, team members at Everything Dinosaur had the pleasure of reviewing “The Princeton Field Guide to Dinosaurs” by Gregory S. Paul. A second edition of this book has just been published, it reflects the dramatic increase in our knowledge of the Dinosauria that has taken place over the last five years or so. This updated and revised edition is essential reading for fans of dinosaurs, as well as academics and professional palaeontologists. This large format book, is more than ten percent bigger than its predecessor, a testament to the increase in the number of new dinosaur genera and species that have been discovered. The second edition includes details of some one hundred new dinosaur species plus updated illustrations and information on very well-known prehistoric animals such as Triceratops and Brontosaurus. Using the tried and tested formula of the first book, Gregory S. Paul guides the reader through the history of dinosaur research, before defining dinosaurs and introducing some of the latest ideas about their biology, senses, vocalisation and pathologies. The author considers aspects of dinosaur behaviour including an assessment of dinosaurs as social, herding animals. Particular attention is given to the evolution and loss of avian flight, in fact, throughout this volume, the close relationship between the Aves (birds) and Dinosauria is emphasised and exquisitely illustrated with a plethora of feathered dinosaur drawings. Each of the main groups of dinosaurs, the Theropods, Sauropodomorphs and the Ornithischians is taken in turn and skilfully segmented to reveal their anatomical relationships. 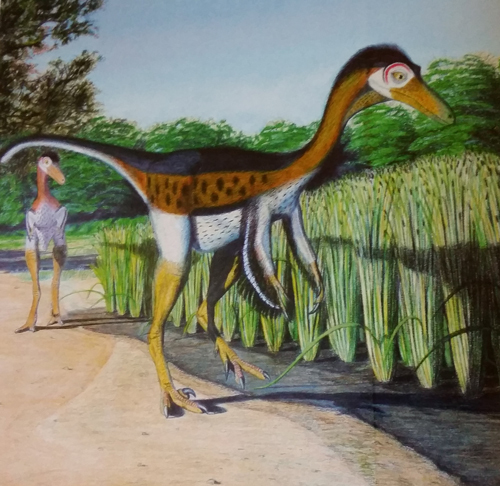 Many of the individual dinosaur descriptions have been extensively revised and expanded, none more so than the likes of Deinocheirus mirificus that adorns the front cover, just one of over two hundred new and updated illustrations. Gregory S. Paul has done a great deal to help change people’s perceptions towards the Dinosauria, his latest book, “The Princeton Field Guide to Dinosaurs”, has clearly been a labour of love for this leading dinosaur illustrator and researcher. It is crammed full of fascinating information, beautiful drawings and the author’s trademark skeletal reconstructions. This new for 2016 edition, remains a must-have for avid dinosaur fans as well as appealing to the general reader with an interest in how some of the most spectacular lifeforms to have ever existed on our planet evolved and flourished. Wonderful dinosaur drawings Stenonychosaurus inequalis (nomen dubium). Recently, Everything Dinosaur reviewed the excellent “The Princeton Field Guide to Prehistoric Mammals”, an up-to-date guide to the diverse and eclectic prehistoric mammals that evolved after the extinction of the Dinosauria. This volume includes many reconstructions of prehistoric mammals never before depicted. Two superb prehistoric animal books.